I’m a sucker for any restaurant with a bit of history and Atkins Park Tavern has it in spades. Originally opened as a deli in 1922, Atkins Park Tavern has the distinction of being Atlanta’s oldest continually operating tavern and a pillar of the Virginia Highlands community. All history aside, it was a rainy day in late December and Jennifer and I were looking for a lunch spot on the way out of town. Atkins Park Tavern fit the bill and after braving the rain, I was ready to see what Atlanta’s oldest restaurant and chef Andrew Smith had to offer. 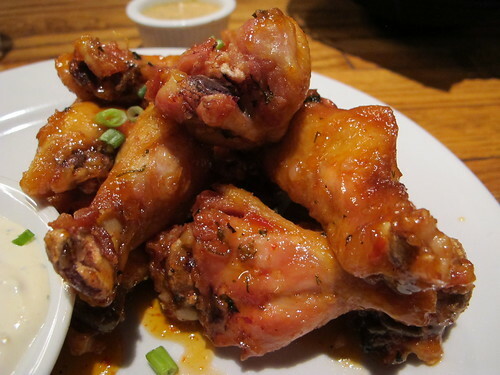 You could call it an effort to fully embrace the upscale tavern approach of Atkins Park or it could just be the lure of a classic cooking technique, but I zeroed in on the confit wings. Slow fried in duck fat and coated in sweet chili garlic sauce, I imagine this is what chicken wings want to be when they grow up. While the skin wasn’t particularly crispy, the sheer silkiness and tenderness of the meat completely overshadowed any shortcomings. 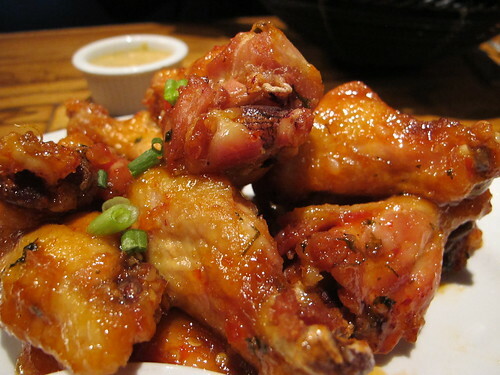 Sweet and just a little spicy, it’s not hyperbole to say that these were the most tender and juiciest chicken wings I’ve ever eaten. Ridiculous as it may sound, one order of fried chicken wasn’t enough as an entrée of southern fried chicken was next. 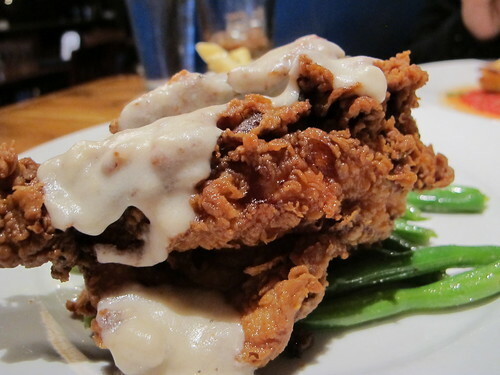 If fried chicken wasn’t enough, the topping of chicken gravy certainly put it over the top. 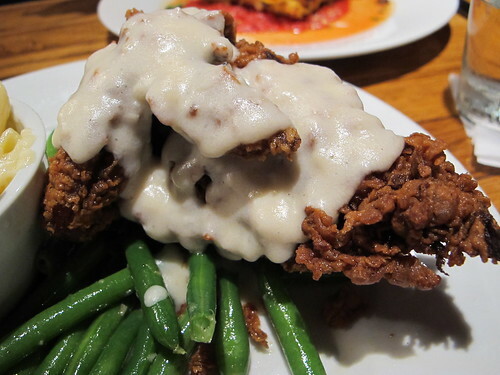 Beneath the thick gravy and even thicker fried breading, there wasn’t much flavor to this chicken breast. 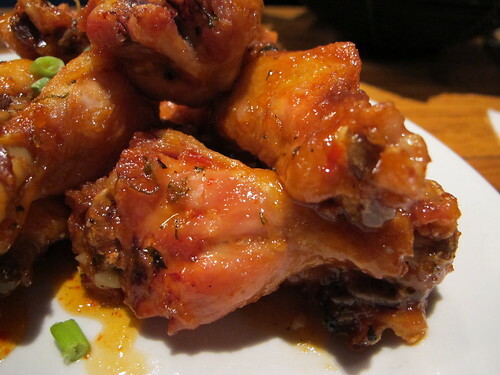 However, Atkins Park Tavern neatly avoided the pitfalls of dry, overcooked white meat. So while the chicken may have gotten second billing to the gravy and batter, it certainly fit bill as well made southern fried chicken. If you’re going to go overboard, you might as well dive in headfirst. 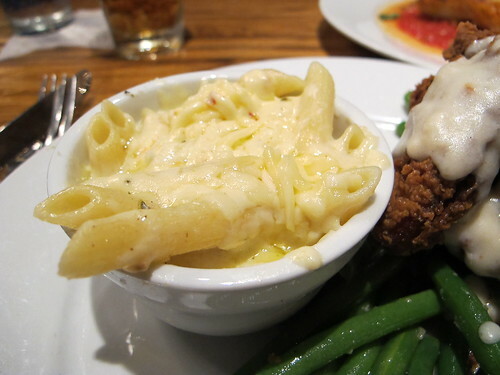 Yes, that’s a side of mac & cheese with the gravy covered fried chicken. The cheese on top may have been a bit oily, but there was a rich, slightly soupy cheese sauce beneath. 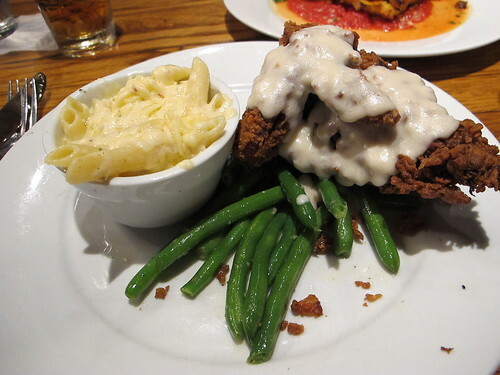 As for the green beans, they were a nice side dish but they were completely overshadowed by the chicken and gravy. Two versions of fried chicken hardly seem like fair criteria to judge a restaurant, but I think they somehow represent what Atkins Park Tavern is to the Highlands. I wouldn’t call Atkins Park a gastropub, more a nice tavern that happens to serve very good food. I don’t know if I’d go out of my way to eat there again, but if I were in the neighborhood, it would be a top choice. That being said, curiosity for grass-fed beef burgers may well get the best of me.